What do you understand by the concept of Workplace Diversity? It is a known fact that each no two individuals are alike. The uniqueness of the individuals may be due to its gender, race, age, class, religion etc. At the same time, the individuals who have unique features tend to possess some of the common characteristics the enable them to develop relations with other individual and thus work towards the performance of the task. The tutorial mainly covers the concept of diversity management along with Workplace Diversity. The tutorial briefly explains about how the implementation of the workplace diversity in the organizations facilitate towards the success of the organization. Who are the audience for learning the concept of Workplace Diversity? This tutorial is mainly targeted for those professionals who are working in the organizations that have a diverse workplace. This tutorial helps those professionals in providing the basic knowledge and understanding about the concept and the approaches towards the concept for implementing in the organization to achieve the goals. What are the prerequisites required for learning the concept of Workplace Diversity? 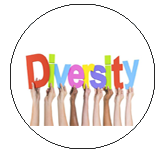 No specific prerequisites are required for learning the concept of Workplace Diversity. It only requires that the person should be sportive and should be open to accept and explore the suggestions provided by the tutorial.